>>>>… over the past three years, an international team of scientists unearthed numerous fossils from eastern Australia dated from 300,000 years ago to roughly 4 million years ago that they now know belong to the Komodo dragon. Now imagine them even BIGGER! Are they still with us today? Considering what we know about the Young earth, they just might be! 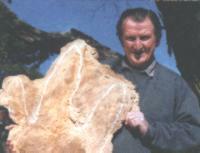 Author/Cryptozoologist Rex Gilroy with the plaster cast of one of the huge three-toed footprints, of a mysterious bipedal reptillian giant creature, found outside Narooma NSW in June 1984. Such a species is known under a variety of names in ancient Aboriginal traditions Australia wide. The plaster cast made by Rex and Heather Gilroy, from a giant monitor lizard footprint, one of a number found by a Moruya NSW farmer in the winter of 1979. Sightings of 3 to 6 metre long giant goanna’s continue to be reported from Moruya and other nearby south-coastal NSW districts.